It's hard to overstate the importance of hydration -- the fluid in your body helps maintain your blood volume, plays a role in nutrient transport and even supports body temperature regulation. If you're bored with plain water, adding a squeeze of lemon might encourage you to drink more. You'll also enjoy other benefits related to lemon juice's vitamin C content. Lemon isn't quite as low in calories as plain H2O -- it's hard to beat "zero" -- but it still fits into a calorie-controlled diet. Each cup of cold water with an ounce of lemon juice contains a negligible 7 calories, which come from its 2 grams of natural carbohydrates and sugar. If you're craving lemon flavor, cold water with lemon juice offers a diet-friendly alternative to lemonade, which contains 99 calories per cup. 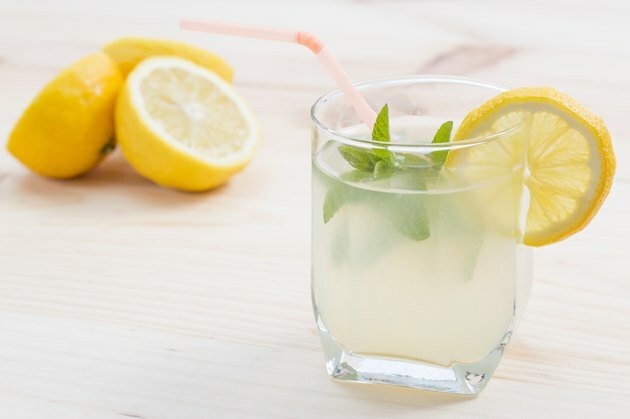 If you were to switch out a cup of lemonade for a cup of lemon water every day, you'd lose almost 10 pounds over the course of a year. Lemon juice in cold water also benefits your skin. Like the other tissues in your body, your skin needs water to function properly, and staying hydrated keeps your skin healthy. Lemon juice's vitamin C content also contributes to skin health. Vitamin C is helpful for making collagen -- a protein abundant in your skin -- and it offers some natural sun protection. Cold water with an ounce of lemon juice offers 11.8 milligrams of vitamin C, which contributes 13 percent toward the daily vitamin C needs for men and 16 percent for women. The vitamin C you'll get from lemon juice in cold water also offers other health benefits. Vitamin C is a potent antioxidant. This means that it helps prevent the oxidation of compounds within your cells -- including your DNA, the fats that make up your cell membranes and your cellular proteins -- that could otherwise cause cell damage and death. Vitamin C might help your body metabolize cholesterol. It also helps you absorb nonheme iron -- the type of iron found in plant-based foods, like spinach and lentils -- to fight iron deficiency. One of the drawbacks of adding lemon juice to your water is its acid content. Acidic foods can eat away at enamel -- the very hard, strong layer that encapsulates each of your teeth -- and contribute to tooth decay. Make sure to dilute your lemon juice in plenty of water, since pure lemon juice is very acidic, and maintain good dental hygiene to help fight tooth erosion. If you're concerned about your dental health, opt for plain water until you can talk to your dentist about your risk.